You are invited to rent this home, which is five miles from many amenities that will delight you. At this home, you will relax and breathe in some fresh air, or relax inside with a book by the fireplace. 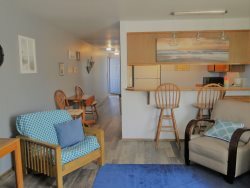 Perfect for all of your secluded enjoyment, and yet close enough to be on the crashing waves and sandy shores of the beach in five (5) minutes walking. Clamming, or just ride on the beach. Local fare five miles away includes casino, restaurants and some shopping, and Ocean Shores has a spectacular golf course for those that play. You get to whip up a delightful meal in full kitchen with new appliances, or BBQ on the new deck out in the back of the home, or just relax with friends next to the fire pit for those tranquil moments of peace. During your stay enjoy free Wi-Fi and an amazon firestick to keep you entertained, along with other things to take to the beach such as the boogie board for surfing. Seabrook, WA is also located approx. 10 miles north and features shops and small stores to enjoy. This 3 bedroom home is in Copalis just a 10 minute drive into Ocean Shores in a very quiet neighborhood. The home has free Wi-Fi, a Wood Burning Fireplace, BBQ and a Washer and Dryer and many amenities in the area. All bedrooms have queen size beds. Bring your book and come relax at the little beach house.